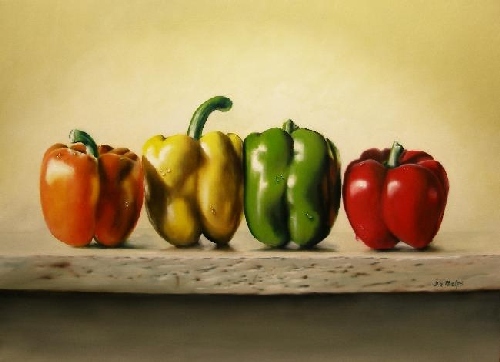 How to paint peppers that are good enough to eat! Paint Peppers that will be good enough to eat! 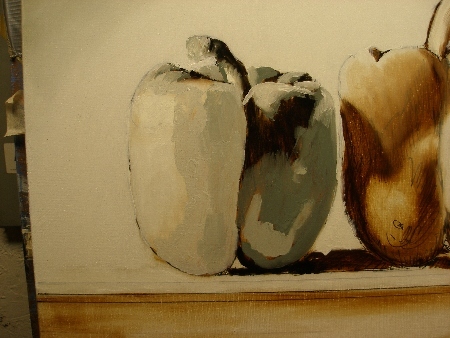 How to paint peppers and not get overheated trying. 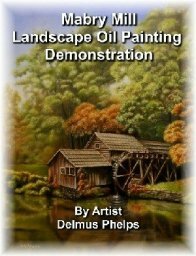 This demonstration uses the flemish multi-layered technique that will astonish most folks at it's simplicity of execution! How long do you think it took me to do this? I get that question a lot, and well, I just smile and say, if I told you would you then ask for a discount? Folks, this method makes this type of painting almost full proof. You get it right the first time, and continue to build on to a great painting with each layer. So what that you mixed the wrong green and noticed it after it was applied. You simply wipe it off and do it again. The previous layers don't seem to mind. Really. Here's where we start. My peppers are lined up on a shelf right at eye level. I couldn't help but grin once they were all there. Kinda reminded me of a bikini contest I once saw on TV but these peppers weren't wearing anything! OH OH. 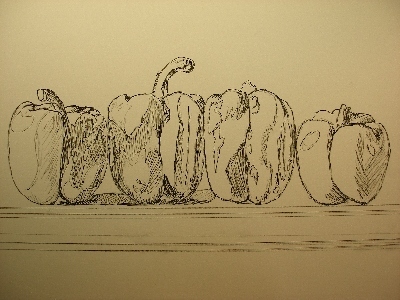 I decided then to just name it "Line Dance Peppers", all that was missing is the cowboy boots on the peppers. 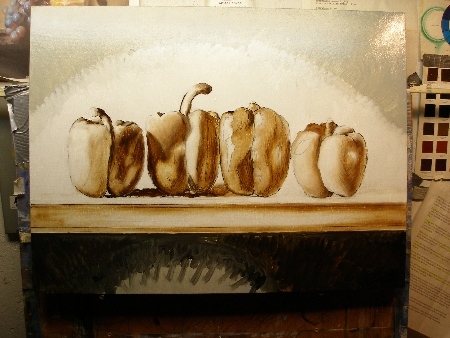 This how to paint peppers demonstration will show you my major steps in accomplishing this wonderful little work. Anyway, here's my drawing that has been redrawn with ink. After the drawing, I go straight in with brown (burnt umber) and white, blocked in roughly. 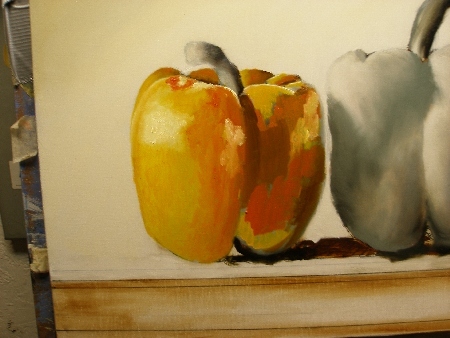 Using a medium sized filbert brush, I then drag, remove, and blend these strokes out to get the shading of the bell peppers. 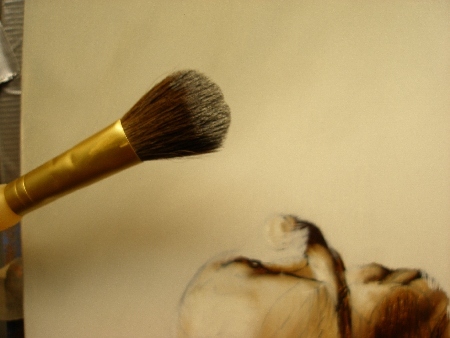 This picture shows you the large mop brush that I use for final blending of the gray areas across the entire work. Here, I've completed the brown underpainting and have blocked in the gray layers in the background. 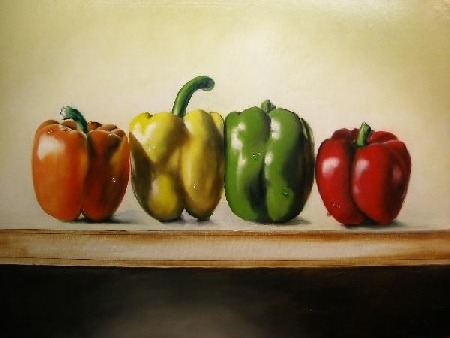 When you paint peppers, keep in mind they are of a solid basic color. Because of this, I wanted to jazz up the background with just a bit of design difference, but again, simplicity is my goal, and the peppers are to be the central focus. The close up of the gray layer blocked in for my first pepper. All peppers blocked in, and blended/corrected with a medium sized blending brush and a final blending with the large mop brush (shown above). My first color blocked in for the orange pepper. Look closely at that particular color. I only have 4 value ranges of the orange. A dark, red orange. A medium orange, a medium light orange and a very light orange. I mixed my medium orange first, then added a touch of red to darken it. 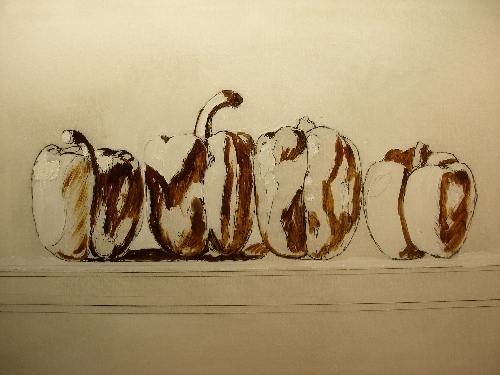 The lighter tones of orange were achieved using only progressively more white. Some of this is directly from Richards color coarse! Here, I've blended my orange on the first pepper and layed in the yellow for the second pepper. 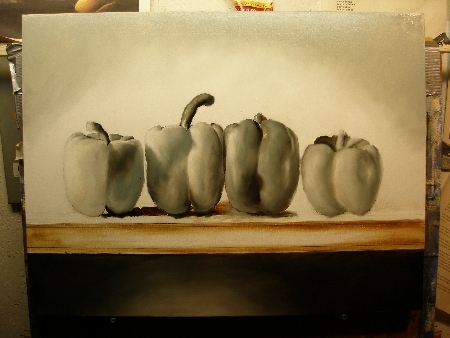 When I paint peppers this way, the process is very fast. Mainly because the color is straight forward, the shadows and underpaintings help guide me, and actually show through the color layer quite a bit, so not much work is needed. One of the things I discuss in both ebooks is the importance of that dead gray layer and how much work it does for you in the subsequent layers. I couldn't resist to put in my dew drops before I worked on the shelf. I really wasn't sure at this point whether to go with a wooden shelf or a granite shelf. And as you can see here, the granite won out! I hope you have enjoyed this demo. Don't forget to sign up for the newsletter in order to get notice when a new one comes out. Best wishes, and happy painting! If you're truly interested in learning this technique, why not learn all the tips including putting those dandy dew drops on your own peppers. Order your own copy of A Real Art Lesson e-book now! 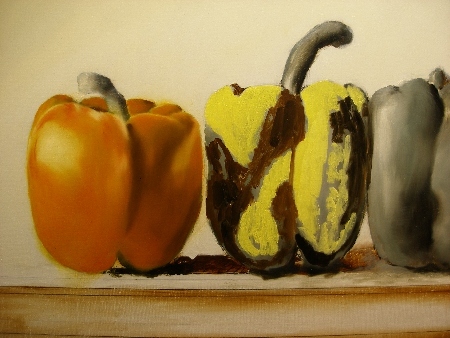 Back to the top of our how to paint peppers demonstration.